There are lots of ways for communities to make decisions and none of them is perfect. Many have grown up in a culture of one-person-one-vote, where the majority gets its way. Often an executive, or one person, is elected to take all the decisions, returning to the community for another election. For some, this represents an unsatisfactory handing over of their power. A democratic vote can make clear decisions, but can also promote division and conflict because the losing minority is unhappy with the outcome. They might acknowledge the legitimacy of the decision, but still actively resist or undermine it, and work towards the next voting opportunity. Compromise is when two or more sides announce their position and move towards each other with measured concessionary and mutual steps. However, this can lead to dissatisfaction on all sides, with nobody getting what they really wanted. Consensus is where everyone works to reach a decision that all can accept. Consensus, in theory, is the product of everybody’s best thinking and gives priority to the cohesion and stability of the group. It’s often slower, though once understood, it can be very effective in situations requiring quick decisions. It’s also creative and inclusive. When minority voices are listened to, the decision can often be better than that swiftly imposed by a simple majority. Number one requirement for consensus is the commitment of every member of the group to make it work. All involved should come in an active, open, seeking spirit. Strong and impartial facilitation/chairing is also essential to keep the process focused and on track. there is enough information from which to make a decision. none of the options is suitable, or the matter is trivial. Every member of the group has an option to veto, or block, a decision they cannot live with. 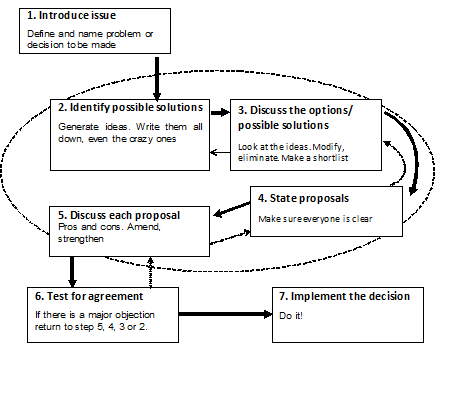 Over-use or misuse of the veto can undermine the process. One way of addressing this is to agree that anyone who wants to block must propose an alternative. Another option is a “stand-aside”, when someone wants to register their disagreement but doesn’t want to stand in the group’s way. Consensus is not only a method of reaching decisions, but also a way of building trust, community, a sense of security and mutual support – especially important in times of stress and emergency. It does require commitment, patience, and a willingness to put the group first. It is a method which becomes easier and quicker with practice and continued commitment.